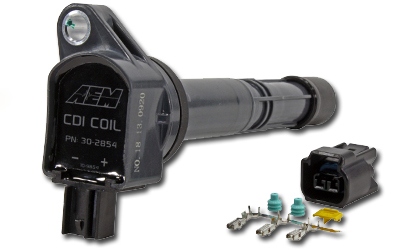 AEM’s CDI Pencil coils are designed for converting your distributed ignition system to a coil-on-plug (COP) system using either a CDI module or 4-Channel Coil Driver. Users can combine CDI Pencil Coils with a CDI module to replace their factory smart coils, or combine a CDI, AEM Engine Position Module and stand-alone programmable engine management system to convert from distributed ignition to COP. All CDI Pencil Coils are two-wire CDI compatible, and must be used with a CDI module. Single CDI Pencil Coil kits, 4-pack kits and connector kits are available. Convert from distributed ignition to Coil On Plug!